Is Samsung Going to Steal Apple's Pay Thunder? The “year of mobile payments” has been a long time coming, but it finally appears that 2015 is going to be it. As a New York Times columnist observed (in terms quoted approvingly by Apple), “A truly mobile wallet has long been described as elusive… most have been a disappointment or have not yet worked well enough for mainstream adoption.” But finally, after several false starts and the occasional false dawn, slowly but surely the pieces are dropping into place. The result should be that by year’s end, in the United States at least, a number of competing and scaled mobile payment options will be live. The lines have been drawn, but the two main contenders are gearing up for a battle in which it is not entirely clear that either of them will be clear-cut victors. Apple used its colossal might (as a recent Fortune article headlined “Apple Is Worth More than Switzerland” noted, the California-based tech giant is also worth more than Google and Microsoft combined) to bring together its own ecosystem in the form of Apple Pay, and finally focus interest and attention on mobile payments in a manner that no-one had achieved before. Many observers were amazed that Apple had not only managed to get on board all the major card issuers and banks, but also to be able to extract from them an estimated 15 bps of their interchange fee for every transaction carried out using Apple Pay. But not only is Apple the most valuable company in the world, it also has at least 400 million credit cards on file via iTunes. Some hints as to how Apple may have been able to get banks to give Apple a cut of their action may be gleaned from court documents that reveal the approach that Apple’s late CEO Steve Jobs took in negotiations with HarperCollins in advance of the launch of the iPad: either you come in on our terms or you stay out and get left behind. And come they did. As well as financial institutions, Apple was able to bring on board many of America’s big name retailers, such as McDonalds, Whole Foods, Walgreen’s, Macy’s, Radio Shack and Toys R Us. The timing of the move was both smart and fortuitous: America’s big retailers are in the process of switching their POS terminals to be ready for Chip-and-PIN (or Chip-and-Signature, in the unusual American variant of the EMV standard), if they weren’t already. This meant that many major retailers were in a position to accept the Near Field Communication (NFC) contactless standard that Apple Pay uses, when they would not have been just a few years ago. And even though at launch Apple Pay was estimated only to be usable in less than 5% of stores across the United States, it grabbed the media’s attention and brought mobile payments, or at least discussion of them, into the mainstream. Having been knocked off its perch as the world’s favorite mobile phone manufacturer, some observers believed that Samsung and the rest of the Android-based phone world (including Google Wallet) would be eclipsed by Tim Cook’s mobile payments ecosystem. Apple has sought to capitalize on the public’s concerns over the security of its credit card details, after well-publicized and embarrassing data breaches at major retailers such as Target and Home Depot, by emphasizing the tokenization process that means customer card details are not transmitted during a payment transaction (see here for Mondato Insight’s explanation of how Apple Pay actually works). Back at Apple Pay’s launch in September, however, Mondato Insightquestioned whether this would be sufficient to change consumer behavior, particularly in an environment where the option to pay by phone would be limited to certain stores. Indeed, prior to the unveiling of Apple Pay in August, we expressed skepticism as to whether Apple was going to get into the payments game with the iPhone rather than the “iWatch”, partly on the basis of a $1 million investment by Apple’s rumored partner, Visa, in the Massachusetts-based start-up LoopPay. What few were aware of, however, was that LoopPay had already secured significant investment from Samsung, who was waiting in the wings and observing Apple’s big play. This culminated in Samsung’s February purchase of LoopPay, which will form the technological backbone of Samsung Pay, the Korean manufacturer’s Android payment alternative to Apple Pay. LoopPay manufactures a number of different payment accessories, including a mobile phone case (disclosure: the author is the owner of a LoopPay phone case; see here to find out why he bought one). Crucially, rather than using NFC, Loop uses a patented technology called Magnetic Secure Transmission (MST) that communicates with over 90% of ordinary mag-stripe card readers. Moreover, Loop was putting itself forward at the vanguard of tokenization before the world had even heard of Apple Pay, meaning Samsung will be able to match Apple on the much-hyped security aspect when Samsung integrates Loop into its Galaxy S6 and S6 Edge phones. In addition, Samsung Pay will also have NFC, meaning users of Samsung Pay will be able to engage in tokenized MST transactions as NFC gradually rolls out across the U.S. along with EMV, as well as using NFC in places that are NFC-ready and where older readers have become obsolete. After lots of positive press and good reviews, recently things in the Apple garden have been a little less rosy. A recent survey of 3,000 iPhone 6 users by Phoenix Marketing International found that although 66 percent had signed up for Apple Pay, almost half reported being unable to use the service in a retailer that was supposed to accept it, with problems ranging from staff unfamiliarity to time-outs and double charging. And while user registration appears to be high – over 800,000 Bank of America customers have registered their cards on Apple Pay – the Phoenix survey found that users had made an average of only 2.6 transactions in total since the service’s launch last September. These figures echo numbers released by Infoscout, which show that 85% of iPhone 6 owners have never tried Apple Pay, while the number who regularly use it, 6%, has barely moved since November. In this light, Samsung would appear to be in a stronger position to build active and regular customer usage than its Californian counterpart. A key component of building consumer confidence and comfort with the service will have to be the reliability and ubiquity of use, which Samsung Pay’s NFC/MST combination should offer. It is only through having muscle memory and confidence that the consumer will not need their wallet that they will be persuaded to leave it at home, and paying by phone becomes the default. On the merchant and issuer side of the equation, Samsung has reportedly decided to forego any fees or charges for its role in Samsung Pay when it is rolled out in Korea this summer. Little wonder, then, that MasterCard and Visa are on board with it. It would be unfair to Samsung to compare its competition with Apple in the payments space to the fable of the tortoise and the hare (if for no other reason than Google Wallet is the hare of the tale). However, first mover advantage may be relatively thin in the payments space for Tim Cook’s company. 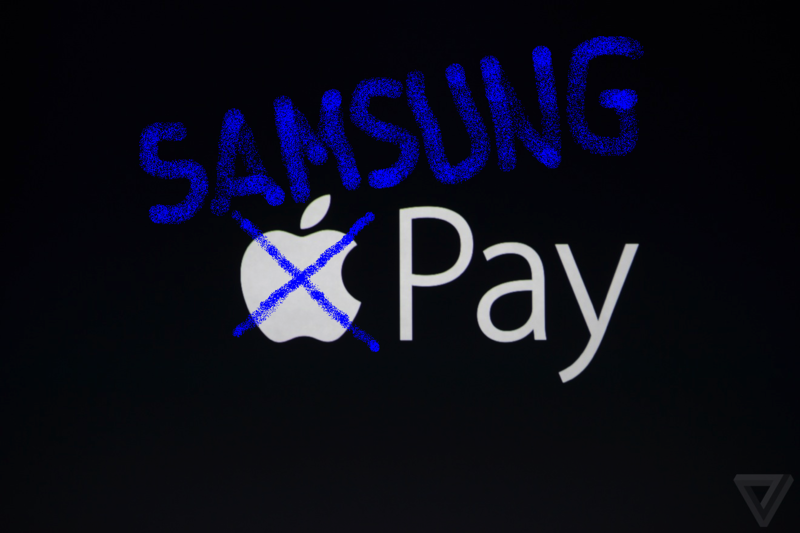 Although it appears unlikely that Samsung would have had the muscle or the reputation to make a credible first move in this space (as Google Wallet and Isis/Softcard would likely attest), it is indeed arguable whether any company other than Apple could have put together a payments ecosystem with sufficient credibility to take the conversation about mobile payments into mainstream consciousness. However, given Samsung’s clear advantages in terms of acceptance, Android users may well be the first to really get into a mobile payments groove, for whom paying by phone becomes the default experience rather than a novelty in a limited number of stores. And for that, perhaps not for the first time, Samsung’s “fast followers” may have Apple to thank. Do Banks Have a Brick-and-Mortar Future?